Four innovative upper-secondary-school students are the winners of this year's Junior Researcher Project with such diverse topics as private stock trading risks, the deselection of German as a foreign language, depression in youngsters and wireless energy in space. 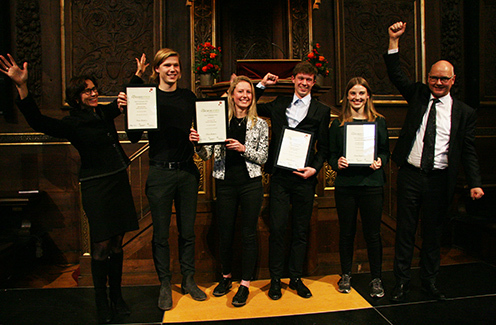 The winners were announced at a ceremony at the University of Copenhagen on 8 December. On 8 December, eight months of project work resulted in applause and cool cash for upper-secondary-school students Anton Lejre Poulsen, Andrea Signe Trolle, Thor Vestergaard Christiansen and Anna Katarina Smit Hinge. They were chosen as the winners in each of their subject categories in the Danish nation-wide talent development competition, the 2016 Junior Researcher Project. From left: Permanent Secretary Agnete Gersing, junior researcher winners Anton Lejre Poulsen, Andrea Signe Trolle, Thor Vestergaard Christiansen and Anna Katarina Smit Hinge and Prorector Thomas Bjørnholm. “In the Junior Researcher Project, we invite talented and ambitious upper-secondary-school students from all over Denmark to exchange thoughts and ideas with supervisors from the world of research. This brings about some truly innovative and impressive projects. And the students are given a push into what might become a future career in research," says Prorector for Research and Innovation Thomas Bjørnholm of the University of Copenhagen, who hosted the awards ceremony and, together with Permanent Secretary Agnete Gersing from the Ministry of Higher Education and Science, presented the four awards to this year's junior researchers. “My hypothesis is that inexperienced private investors who use stock trading tools without the necessary source criticism and knowledge are exposed to a very high risk of being cheated by stock price manipulation. Financial fraudsters may for example seek to boost prices artificially through false or misleading recommendations," says Anton Lejre Poulsen, who with his project wishes to foster a safer investment culture. “Even though Germany is Denmark's largest trade partner, many students opt out of learning German. New political framework conditions will strengthen German as a school subject, but the question is how it will affect students’ motivation for the subject," Andrea Signe Trolle says. “My hypothesis is inspired by the challenges of ESA's Rosetta mission in 2004 when the comet lander Philae by mistake ended up in the shade. This meant that it could not use its solar panels and therefore could not complete the planned observations. If Rosetta could have transmitted energy via microwaves to Philae, ESA would probably not have been forced to abandon Philae,” Thor Vestergaard Christiansen says. “A survey from 2015 shows that almost 2,000 Danish youngsters are diagnosed with depression annually. That’s an extremely high number - and the highest incidence of depression in any age group! Many in this age group are under education, and memory failure due to depression can be totally disabling," Anna Katarina Smit Hinge says. The Junior Researcher Project is a nationwide talent development programme for students in the four types of Danish upper-secondary education. In 2016, a total of 112 junior researchers completed and submitted their proposal for a research project, 12 of which were nominated for the finals. See the 12 junior researcher project nominees.